The famous turtle program was the fruit of the debate between Richard Dennis and William Eckhardt, on the issue of whether traders are can be nurtured. Dennis believed it can but Eckhardt thought otherwise. Hence, they decided to make a bet by recruiting people from diverse background and most without experience. The book covered the entire story of the turltes, from the beginning of the program to what happened after the program. 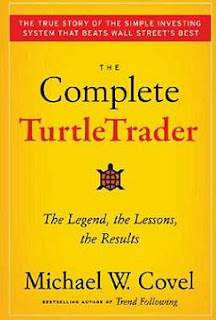 Instead of summarizing the process of how the turtles were hired etc, I will only focus on the information and attributes that makes one a good trader which I picked up from the book. In addition, I will introduce the turtle trading method.